The No. 23 Nissan GT-R LM Nismo - LMP1, driven by Olivier Pla, Jann Mardenborough and Max Chilton, competes at the 24 Hours of Le Mans. 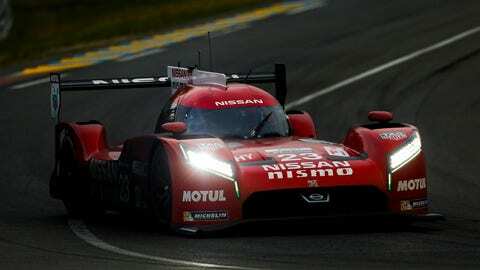 The Nissan GT-R LM NISMO will not return to FIA World Endurance Championship competition until 2016, following a decision to address ongoing technical issues with the front-engined, front-wheel drive LMP1 car. Additionally, the Japanese manufacturer has confirmed a restructuring in management, with the appointment of Michael Carcamo as new team principal, a position previously filled by Ben Bowlby. The car, which completed a two-day test at Circuit of The Americas last week with Harry Tincknell and Olivier Pla, went “significantly faster” than it had previously done at the Texan circuit, according to a team release. However, it was still not running with hybrid power or the bespoke tire specification developed for the car, with further testing and development planned in the coming weeks and months. “We are committed to competing at the highest level and we are not happy when we are not winning,” said NISMO President Shoichi Miyatani. In addition to Carcamo, a former Illmor trackside engineer, who transfers from Nissan Mexico, It’s understood that NISMO Chief Operating Officer Motohiro Matsumura is no longer part of the LMP1 program. Bowlby, meanwhile, remains on as technical director. “Ben had his hands full trying to do everything; managing the design and build but also the race and test operation,” Carcamo said. “That’s a lot to ask anyone to do, especially with a concept that requires this level of development. It’s understood the same front-engined, front-wheel drive concept for the GT-R LM NISMO will be carried over into 2016. “The challenge that we took on was a monumental task,” Carcamo added. “We have to learn all of the dynamics of this new vehicle and all the performance tuning so it takes a long time to find the sweet spot of performance.